Aluminium is the third most abundant element (after oxygen and silicon), and the most abundant metal in the Earth’s crust. It makes up about 8% by weight of the Earth’s solid surface. Aluminium is remarkable for the metal’s low density and for its ability to resist corrosion due to the phenomenon of passivation. Unlike some metals used for roofing and cladding, aluminium is well tolerated by plants and animals. Aluminium is effectively 100% recyclable and in Europe aluminium experiences high rates of recycling, ranging from 42% of beverage cans, 85% of construction materials and 95% of transport vehicles. Recycled aluminium is known as secondary aluminium, but maintains the same physical properties as primary aluminium. Secondary aluminium is produced in a wide range of formats and is employed in 80% of alloy injections. Another important use for aluminium is for extrusion. Thicknesses above this would be used for cladding panels, both supported and self-supporting. 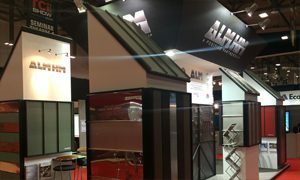 Aluminium is the most popular metal in use with regard to external roofing and cladding. This is due to it being readily available and its ability to cover wide expanses at a low cost. Being a painted or coated product, Elval aluminium can be obtained in any RAL colour and with huge advances in paint technology, the colour lasts for many many years with guarantees from 5 to 25 years depending on the finish selected and the projects location. Coastal and Industrial environments affect the life expectancy of all metals used in construction. With natural material finishes such as zinc, copper or stainless steel the finish is never guaranteed, only the metal. With Aluminium the painted surface will still have a guarantee, but this could be limited to 5 or 10 years depending on proximity to the sea or industrial area. Whilst surface finishes can be more vulnerable in these locations, the metals themselves will still out perform many other products used for the same application giving the building owner many more years of low maintenance service.